How Does Owning a Trampoline Affect Your Homeowners Insurance? Who doesn’t enjoy the carefree fun of bouncing around on a backyard trampoline? From small fitness rebounder trampolines to massive just-for-fun trampolines, these jumping devices represent timeless nostalgia and countless hours of enjoyment for many people. However, from a homeowners insurance standpoint, did you know that having a trampoline at home can actually affect your homeowners insurance policy? It’s true. While you’re not required to report such a fun backyard toy to your insurance provider, there are a number of situations where it might make sense to do so, believe it or not. We’ll get to more on that below. While no one plans on getting injured on a trampoline, getting in a car crash or experiencing a natural disaster, life happens and it is often unexpected. That’s why Bradley’s Insurance offers Ottawa house insurance and auto insurance in addition to other policies that help protect you from the worst possible situations. Again, in a perfect world, insurance wouldn’t be necessary, but costly events and mishaps can and do occur on a fairly regular basis. 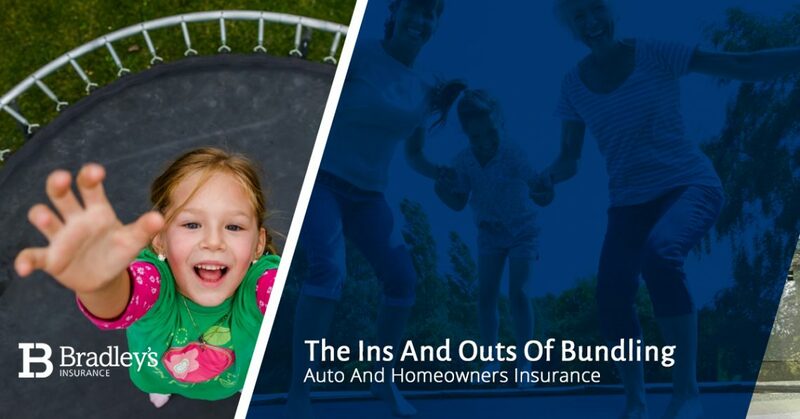 Be prepared by getting home insurance with a trampoline and other policies from our Stittsville insurance brokers. To get started, make your first move by getting in touch with Bradley’s Insurance today. If you have a trampoline at home, we highly recommend that you absorb the following information. Let’s take a look. True or false: Your homeowners insurance can increase if you have a trampoline on your property. Well, you may have been able to insinuate this answer based on the subject of today’s blog, but yes, the above statement is true. Not only that, but it’s also true that you’re responsible when someone trespasses on your property, plays on your trampoline, and gets injured, as unfair as that might sound. Finally, it’s true that your insurance company also has the power to cancel your homeowners policy because you have a trampoline in your backyard. Thinking About Getting a Trampoline? Again, trampolines are a wonderful source of fun and carefree joy, so we don’t want to come across like we’re discouraging the greater Ottawa community from getting one. However, if you don’t already own a trampoline, it is important to check your homeowner’s policy for any clause that refers to attractive nuisances like trampolines and pools. That way, you’re less likely to experience any unpleasant surprises, and your Ottawa insurance agent can also advise you on the insurance company’s policies should you add a trampoline to your property. The insurance provider in question may offer coverage if you add various safety features to the equipment such as safety netting that encloses the jumper. Additionally, something like a fence with a locked gate may also work by protecting homeowners from uninvited or unwanted guests. Though not always the case, your insurance company may require an exclusion to your policy regarding injuries from a trampoline accident. This means that your premium may not go up necessarily, but all medical costs related to the trampoline may come out of your pocket, and that could be expensive. Additionally, your premium may go up if you do have a trampoline. On average, this premium increase could be between $50 to over $100 in order to increase the liability coverage. Some insurance companies recommend additional liability coverage between $50,000 to $100,000 on top of the standard $300,000 for homes without trampolines. This is also relative to the value of the home and property in question. It’s not likely that you’re renting a trampoline, but many Ottawa residents rent their home. Renter’s insurance may cover injuries sustained by a trampoline, but not always. If someone who doesn’t live on the rental property gets hurt, the landlord may be sued because it is their property. However, the landlord’s insurance policy may also be canceled because of the tenant’s trampoline. If you’re a renter and you’re in doubt about your liability coverage, double-check to see if your landlord permits trampolines on the premises or if they have a clause in their insurance policy for trampolines. The amount of money you can save, should something go wrong on your trampoline, is definitely worth the time it takes to look into your renter’s insurance policy. Sadly, a trip to the emergency room can cost much more than an increase in your insurance premium. As fun and enjoyable as jumping on a trampoline can be, accidents can result in lifelong consequences – the neurological damage sustained from some falls can be permanent. So, it is crucial that you reduce these risks by providing the right amount of immediate adult supervision and other safety precautions. Be sure to follow the manufacturer’s guidelines for the number of users as well as weight requirements for your specific model of trampoline. Trampoline or no trampoline, Bradley’s Insurance is here to help Stittsville expect the best but prepare for the worst. Are you prepared? With home and auto bundle insurance options available, our Ottawa insurance brokers are prepared to help you. Contact us with any questions about your homeowners policy today.